A lot of genealogy bloggers are into mutual fun like Carnival of Genealogy (which threatens to explode from its own popularity) and Wordless Wednesday and lord knows what else. And a creative and humorous lot they are! Now I hear even more networking rumours that involve FaceBook of all places. Gaggles of genie bloggers unite? Next thing you know, they will start having categories and contests and star grading systems. Or oscars. I don’t have to worry about it because no-one reads this blog anyway so I can carry on self-indulgently without anyone (especially me) taking myself seriously. Having viewed some beautiful photographs on Wordless Wednesday, I enjoy them. Mostly, they speak for themselves. The slight hint of mystery about a photograph with no wordy exposition is alluring. Now you find me thinking of doing something about it, as in acknowledging a nice idea without being FaceBookably sociable or submitting to weekly pressures. My problem is that I can scarcely get one or two posts per month up, never mind one every Wednesday. On Wednesday I won’t even be here. Sunday will have to do. So now that I’ve yapped on blithely about being wordless, I’m doing a photo. I believe a previous post threatened to expand on a certain non-genealogy topic. One might title this Where It All Began which may or may not offer a certain je-ne-sais-quoi mystique. Sakhara City, 1961. Photo by Janice Cooper, in possession of Brenda Dougall Merriman 2008. The things that drive a genealogist crazy. This is a four-part whine for the benefit of the uninitiated who may have the slightest curiosity about why we are crazy. (1) The old seignory of Argenteuil in Quebec measured 54,000 acres. Development first began about 1800 at St. Andrews village and the agricultural area around it. 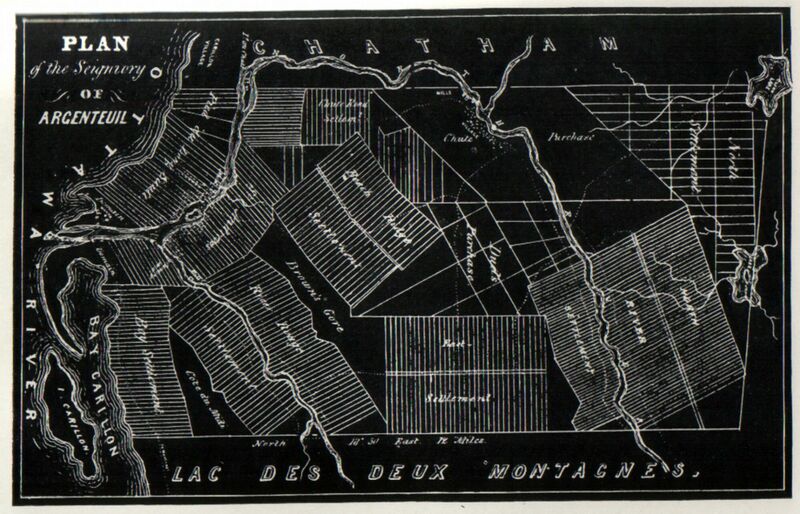 Early provincial surveyor Joseph Bouchette’s A Topographical Dictionary of the Province of Lower Canada (1832) informs us that 520 farm lots had been created in the vicinity, and the village at the time of the 1831 census had a population of 2,550. Genealogically speaking, this is not an overly large pool in which to trace several Fraser families, even when we add on nearby Lachute and other growing settlements. Even better, there are early census returns and church registers filling the period from about 1800 to 1850. Map courtesy of the Comte d’Argenteuil’s website at www.comte-argenteuil.com/ and likely derived from M. Bouchette. I love this map. I am so happy M. le Comte put this on his website. Nevertheless, my question du jour is why on earth have I found so many stray Frasers in a fifty year period? Twenty of them, and still counting! Strays are those pesky people who turn up, usually once! ... with no apparent link to the families being studied. They don’t fit. I would like them to fit. Some of them are Scottish-born immigrants who could be siblings or cousins and could possibly shed light on the overseas connection. "Family reconstitution" is a familiar phrase in this genealogy business. Sigh. It involves attempting to reconstruct ancestral "nuclear" families and in this case must embrace at least the last generation born in Scotland. (2) Three important, early census returns exist for the seignory of Argenteuil. They are for 1825, 1831 and 1842. Counting all three, there are nine Fraser households, some of whom are mine. Nine men are named as the heads of households in those three periods. That’s the good news. This is typical of Canadian census returns prior to 1851—only the "heads" are named. But within those household statistics the real total is 73 Frasers. So you see the bad news ... no names for the other 64 children, grandchildren, aged parents, mothers-in-law, uncle, nephew, and strays like farm workers and domestic help. The government does provide column after column of statistics for each household. Sometimes the columns extend for pages. Imagine trying to follow say John Fraser on line 31 across four or six pages of numbers when the heading on each column is out of sight, or it’s in French, or a large ink blot obscures what you want. Trust me, even the enumerators got confused. Household totals and the age categories for individuals (e.g. "over the age of six and under the age of fourteen") are frequently off-kilter. Wouldn’t it have been a lot easier just to name each person in the house? A tiny example of identifying each family goes something like this. One John Fraser might be recorded as having four children under the age of six, three of them girls. We try to match this household with a John Fraser who probably had daughters born before 1825 but after 1818. More or less. If the church registers have baptism records back that far. Or if they fit with adult daughters in later censuses. If none of them succumbed to infant mortality in the meantime. (3) Here is a characteristic Highland Scots complaint. My Frasers wanted to call all their sons John, James and Alexander, etc. And their daughters Ann/Nancy, Elizabeth and Mary, etc. The sons and daughters all had children and of course used the same names. Soon we have four or five Nancys and Johns born within a few years. One would expect the later census returns that do name all members in a family/household would help untangle this. But did they all stay at home? No! Inevitably they go to visit Fraser cousins or work for an uncle or care for a grandparent just when the census-taker was at hand. Today’s researcher is left wondering is that Alex’s John or John’s John? John’s Nancy or James’ Nancy? So you can be darn sure of the chaos by the time the third generation arrived. (4) Why is the page with *MY* Nancy missing in the 1861 census?! Who Dunnit or Who Dinna Do It? Like so many genealogists, I devour crime and mystery fiction (murders, lawsuits, terrorists, spies). Detective work and genealogy share great similarities regarding identification of the suspects and the collection of evidence. Exercising the brain reportedly keeps it from calcifying; let’s hug that thought! It’s hard to decide who my favourite detective is. Then again, who says I have to pick just one? My list is amended as new authors appear and the quality of others waxes or wanes. Ideally a preferred author produces a new book every two years, but it doesn’t always work that way. "If Dashiell Hammett [Sam Spade] can be said to have injected the hard-boiled detective novel with its primitive force, and Raymond Chandler gave shape to its prevailing tone [Philip Marlowe], it was Ken Millar, writing as Ross Macdonald, who gave the genre its current respectability, generating a worldwide readership that has paved the way for those of us following in his footsteps." Macdonald’s writing is lean and mean, perfect for the laconic California private eye he sent on dozens of cases. A number of them involved families in multi-generation context, dear to the heart of genealogists. Macdonald was born Kenneth Millar in California, but was raised in Canada, attending high school in Kitchener, graduating from University of Western Ontario, and doing post-grad work at the Ontario College of Education before becoming a teacher. Macdonald elevated the genre to literate mastery. My current A-list begins with Martin Cruz Smith’s prosecutorial investigator Arkady Renko, a man sometimes bowed but seldom beaten by the vagaries of Russian authority. In the course of the novels he manages to survive the transition from the soviet hammer to capitalist chaos to whatever is emerging today. He has deep, barely concealed contempt for his superiors, whatever their stripe. Their continual bureaucratic attempts to demoralize him rarely affect his totally engaging character. Renko sometimes second guesses himself, but even his melancholic observations have a dry humour. Renowned for his debut novel, Gorky Park, Smith does not produce a Renko novel every two years, to my regret. Sequels like Polar Star and Red Square describe the absurd necessities and exigencies of daily life and work in a disturbing country, all fodder for the Russophile reader. Smith’s graphic portrayal of the Zone of Exclusion at Chernobyl in Wolves Eat Dogs is not for everyone’s taste but who would not appreciate his black market scenes of the 1990s in Red Square, or descriptions of Cuban street life in Havana Bay? Luckily for me, I still have Stalin’s Ghost to look forward to. A close second is Donald James’ (aka Donald J. Wheal) police inspector Constantin Vadim who has slightly more authority and job security than Renko. This man is hot. His rather dishevelled approach to life involves many a thumb of vodka, unique expletives and superstitious ruminations on the mythical proportions of Russian folklore. Like Renko, Vadim is no indiscriminate skirt-chaser; he is true-blue to his wife. Actually, a different wife in each book. The first Vadim novel Monstrum is set in the year 2015 in a Moscow emerging from a realistic civil war. In the post-war aftermath, orphaned children are the biggest victim statistics. The next in the series is The Fortune Teller where Vadim has been moved to his hometown, the Arctic port of Murmansk. There he untangles mysterious murders and battles the slave trade with another cluster of priceless characters. But it would not be Russian if some tragedy were absent. The third novel, Vadim, is disappointingly set mainly in the USA where Vadim becomes embroiled with politicians. A tuberculosis epidemic is sweeping Russia, causing millions to flee. My hero has quit the police militia and is not in his old form in this unfamiliar milieu—America is emasculating him. I had to wait until page 275 for his return to Moscow to see the passionate Russian emerge once again to navigate the plot twisting. The ending is an opening for more activities and more wives. But oh-oh, that was published in 2000 and we fans still wait. To be continued. Which mystery authors and characters do YOU like? ?